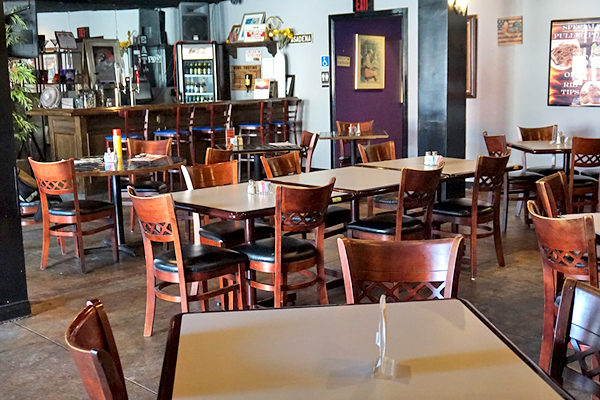 Big Mama’s is a family owned & operated restaurant in Pasadena, CA. 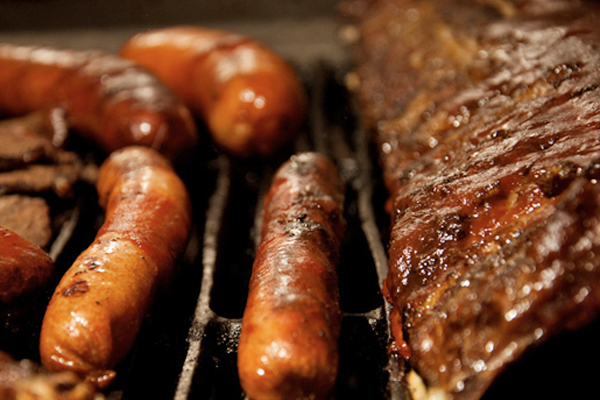 We serve the finest barbecue and southern eating this side of the Mississippi. Because of our unique cuisine and southern hospitality, we attract diners of all walks of life. 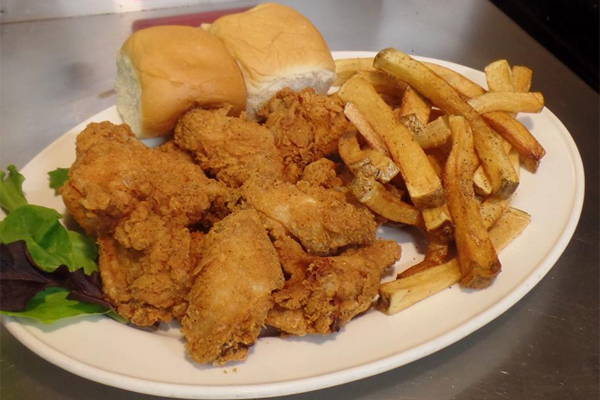 It is true “down home” Southern food, crafted with careful attention to the tradition & love handed down from Big Mama’s original personal recipes. 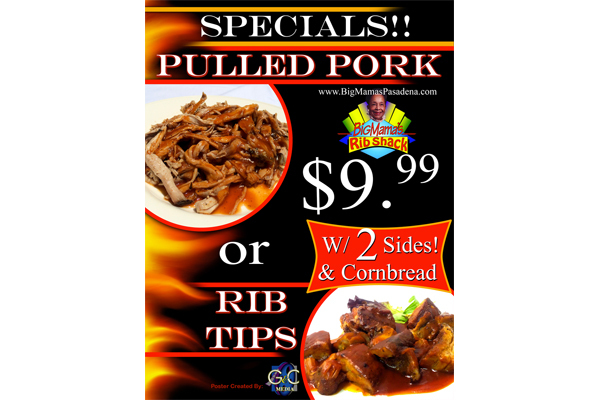 Big Mama’s Rib Shack specializes in home made Southern Creole & BBQ cuisine. 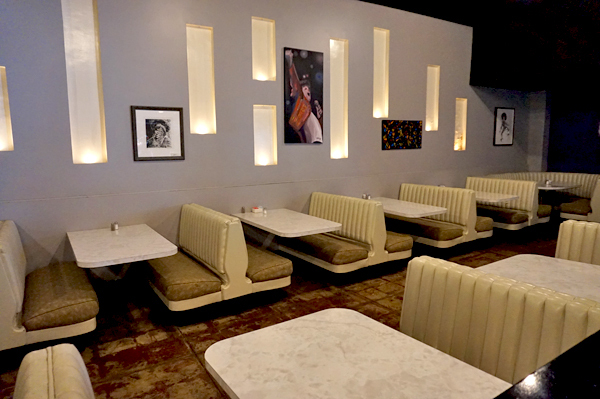 Come get your creole fix with entrees such as Jambalaya, Gumbo or Shrimp and Chicken Creole or Smothered Pork Chops. Need some BBQ? 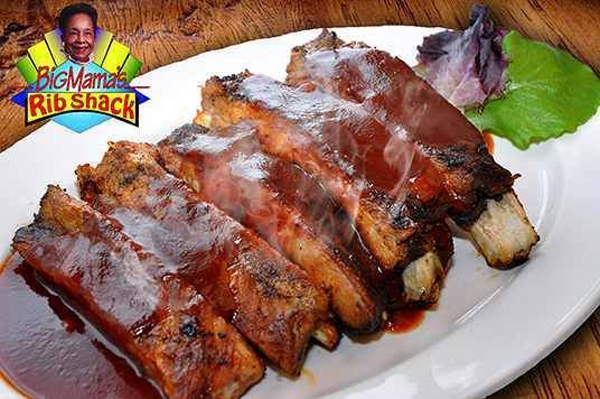 Our sauce is boss and it graces our Baby Back & Pork Spare Ribs, BBQ Chicken or Hot Links entrees! In the mood for seafood? 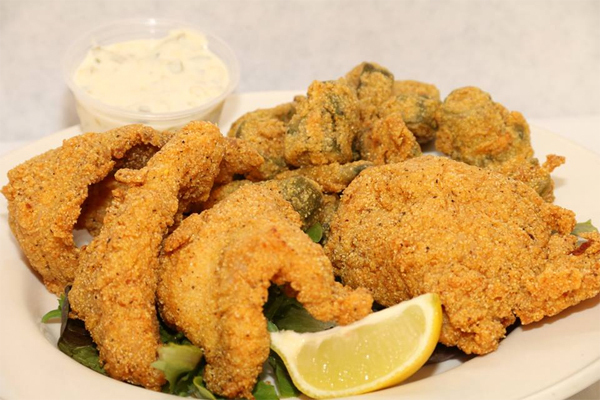 Come try our Fried Catfish or Snapper, Oysters or Blackened fish entrees. Our side dishes such as Candied Yams, Greens, Okra and Baked Beans are just a few of our specialties. Of coure we can’t forget our deserts…come try our Peach Cobbler, Red Velvet Cake or Pecan Pie. Big Mama whose real name is Emma sue Miller McWhorter was Born in Burda, Georgia (just outside of Griffin, south of Atlanta), Big Mama and her husband James “Candy Jim” McWhorter then migrated north to Chattanooga, TN ,where she owned and operated restaurants. 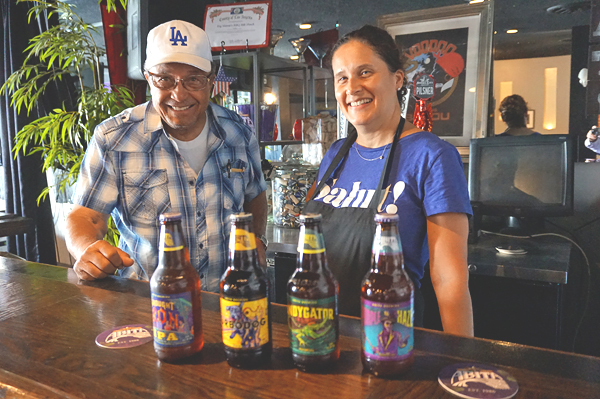 Big Mama’s son Dargin and his wife Anita opened “Big Mama’s fish and BBQ”on Fairoaks in Altadena, CA, then opened in the early 80’s in Old Town Pasadena, CA on Colorado blvd. between Fairoaks and Raymond. Dargin McWhorter, with Big Mama coaching from the sidelines, and the help and support of his wife Anita and children opened the doors of Big Mama’s Cooking, Inc. on March 7th, 1992 in Las Vegas, NV. 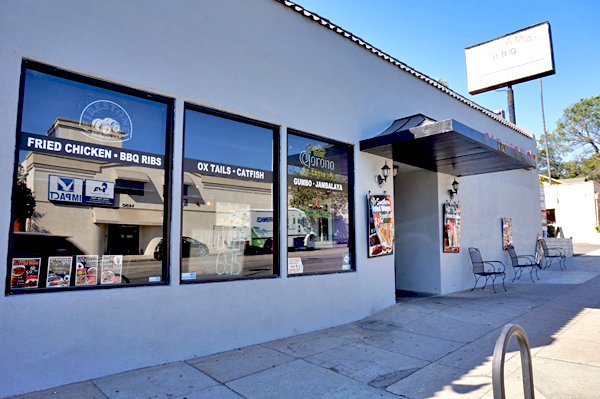 On September 20, 2002 Dargin’s children opened the Pasadena restaurant in a fine location on North Lake Ave.
Big Mama makes most of our delicious food to order so an appetizer is a good way to go while you wait! All big mama’s salads include chilled red beans, corn, cucumbers, tomatoes, crumbled cornbread served over a spring mix shredded cheese is .50c extra. Your choice of ranch, Italian or balsamic dressings. 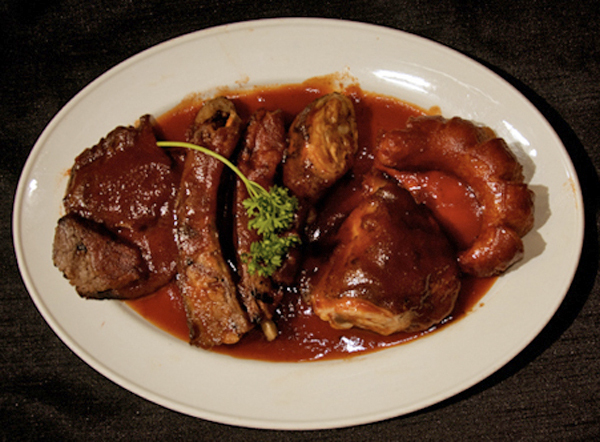 Entrees include two side orders except smothered chicken, smothered pork chops & red beans and rice plates. 3 pieces of chicken (2 thighs & 1 leg) battered Southern fried to a golden brown. White meat $1.50 extra. This item takes 20 minutes to cook. 3 pieces of tender juicy chicken (2 thighs & leg) smoked on our pit and covered in sauce. Choice of two sides. White meat $1.50 extra. (spicy) Tender succulent boneless breast of chicken blackened to perfection with Big Mama’s own blackened seasoning. Choice of two sides. 4 wings battered Southern fried to a golden brown. This item takes 20 minutes to cook. Leg & thigh battered Southern fried chicken smothered in gravy served over rice. Choice of one side. White meat $1.50 extra. This item takes 20 minutes to cook. Smoked chicken served over a bed of red beans rice and grilled onions. Choice of one side. 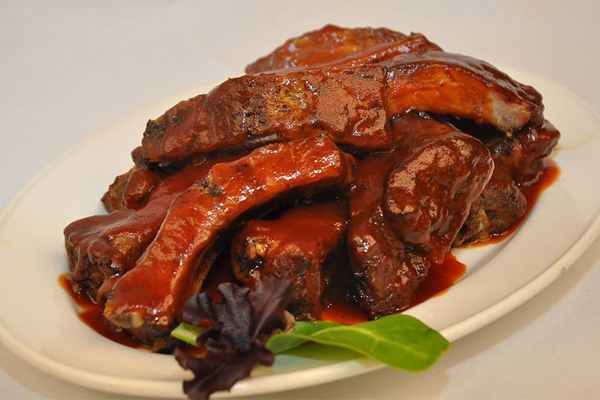 BBQ Ribs slowly smoked with hickory then smothered with our BBQ sauce. Choice of two sides. Slow smoked tri tip sliced, grilled and topped with Big Mama’s BBQ sauce. Choice of two sides. Slow smoked brisket, grilled and topped with Big Mama’s BBQ sauce. Choice of two sides. 5 pork spare ribs cut from the slab, smoked on our pit. Choice of two sides. Slow smoked pork sliced, grilled and topped with Big Mama’s BBQ sauce. Choice of two sides. Delicious Louisiana spiral cut links covered with our BBQ sauce. Choice of two sides. 2 center cut chops battered southern style with Big Mama’s special batter. Choice of two sides. 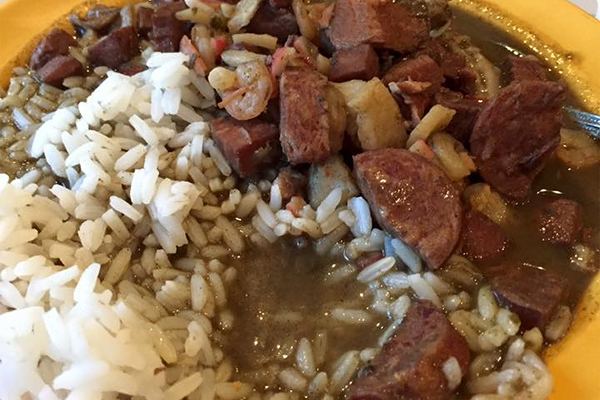 Louisiana hot links served over a bed of red beans, rice and grilled onions. Choice of one side. 2 battered South ern fried pork chops smothered in gravy served over rice. Choice of one side. 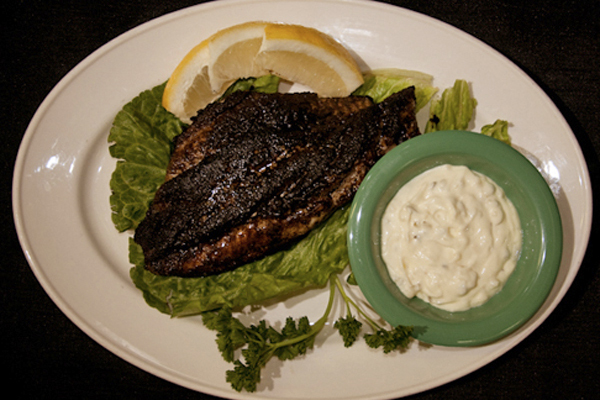 (spicy) Catfish filet seasoned with a selected mixture of herbs & spices, blackened or grilled on both sides. Choice of two sides. (spicy) Fish filet seasoned with a selected mixture of herbs & spices, blackened or grilled on both sides. Choice of two sides. Delicious sliced filet deep fried in Big Mama’s batter. Choice of two sides. Shrimp seasoned with a selected mixture of herbs & spices, blackened or grilled on both sides. Choice of two sides. 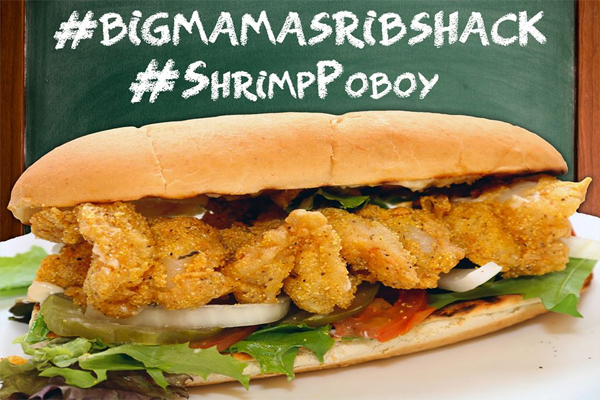 Shrimp dipped in Big Mama’s batter & deep fried. Choice of two sides. Medium size deep fried in Mama’s batter. Choice of two sides. Almost enough for 2 to share. 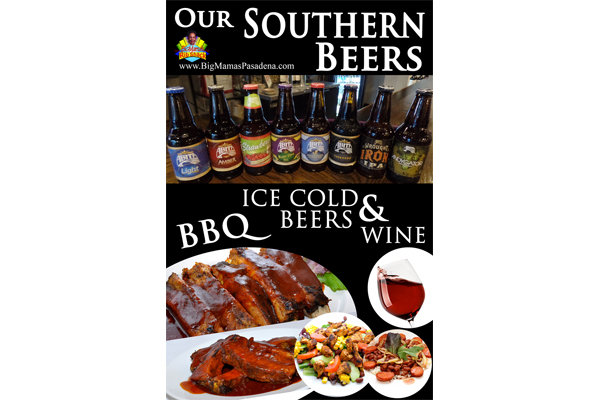 Definitely a nice way to go to become familiar with a variety of Big Mama’s offerings. No substitutions. All combos include 2 side orders. Jambalaya, gumbo, chicken & shrimp creole (mixed) served with hush puppies.